Have you ever wonder how is the latest smart phone should be? If your answer is yes, here is the latest from Apple in the market. The biggest thing to happen to iPhone since iPhone. When we envisioned the new iPhone, we landed on a remarkably thin and light design. But it’s nearly impossible to make a device so thin and so light without sacrificing features or performance. We could have taken the easy way out and designed something more reasonable and less remarkable. But we didn’t. If the technology didn’t exist, we invented it. If a component wasn’t small enough, we re-imagined it. If convention was standing in the way, we left it behind. The result is iPhone 5: the thinnest, lightest, fastest iPhone ever. iPhone 5 is just 7.6 millimeters thin. To make that happen, Apple engineers had to think small, component by component. They created a nano-SIM card, which is 44 percent smaller than a micro-SIM. They also developed a unique cellular solution for iPhone 5. The conventional approach to building LTE into a world phone uses two chips — one for voice, one for data. On iPhone 5, both are on a single chip. The intelligent, reversible Lightning connector is 80 percent smaller than the 30-pin connector. The 8MP iSight camera has even more features — like panorama and dynamic low-light mode — yet it’s 20 percent smaller. And the new A6 chip is up to 2x faster than the A5 chip but 22 percent smaller. Even with so much inside, iPhone 5 is 20 percent lighter and 18 percent thinner than iPhone 4S. It`s our thinnest display ever. And it`s the first of its kind. Making a thinner, lighter iPhone meant even the display had to be thinner. Apple engineers accomplished that by creating the first Retina display with integrated touch technology. Which means instead of a separate layer of touch electrodes between display pixels, the pixels do double duty — acting as touch-sensing electrodes while displaying the image at the same time. With one less layer between you and what you see on iPhone 5, you experience more clarity than ever before. All on a display that’s 30 percent thinner than before. iPhone 5 is made with a level of precision you’d expect from a finely cafted watch — not a smartphone. Never before has this degree of fit and finish been applied to a phone. Take the glass inlays on the back of iPhone 5, for instance. During manufacturing, each iPhone 5 aluminum housing is photographed by two high-powered 29MP cameras. A machine then examines the images and compares them against 725 unique inlays to find the most precise match for every single iPhone. Look at iPhone 5 and you can’t help but notice the exquisite chamfer surrounding the display. A crystalline diamond cuts this beveled edge. It’s what gives iPhone 5 its distinctive lines. Fitting for a phone so brilliant. During the assembly process, each iPhone 5 aluminum housing is photographed by two high-powered 29MP cameras. A machine then compares the images with 725 uniquely cut inlays to find a precise match. 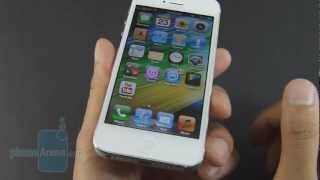 – A crystalline diamond is used to cut the chamfers of iPhone 5. This process gives the beveled edge its beautiful sheen. All-new design. The thinnest, lightest, fastest iPhone ever. It’s hard to believe a phone so thin could offer so many features: a larger display, a faster chip, the latest wireless technology, an 8MP iSight camera, and more. All in a beautiful aluminum body designed and made with an unprecedented level of precision. iPhone 5 measures a mere 7.6 millimeters thin and weighs just 112 grams.1 That’s 18 percent thinner and 20 percent lighter than iPhone 4S. The only way to achieve a design like this is by relentlessly considering (and reconsidering) every single detail — including the details you don’t see. Apple, the Apple logo, Mac, Mac OS, Macintosh, iPhone, Retina, Passbook, Siri, iSight, FaceTime, Lightning, EarPods, Flyover, Safari and iCloud are trademarks of Apple. Other company and product names may be trademarks of their respective owners.